Something is wrong with our view of the universe as propagated by physicists around the world. The contradictions are glaring and the sums don't add up. And yet - we are told that red-shifted light from the stars is evidence of a continuous expansion of the universe, an expansion that started with a primordial explosion or big bang, and that is still going on to this day. 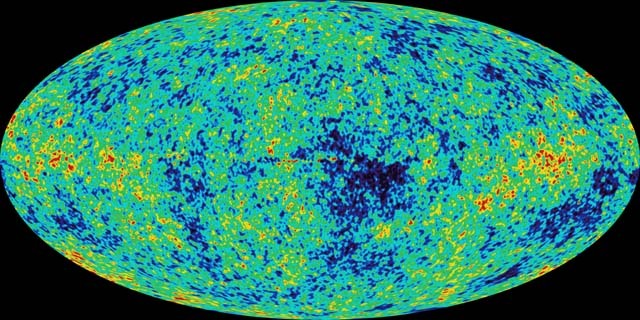 Big Bang 'afterglow' or thermal anisotropy of the universe? Robert Neil Boyd questions that 'received wisdom' in a recent article. He argues that observation is far superior to theory. Whenever an observed fact contradicts a theory, the latter has to give way. We need to re-think and find a better explanation that fits all of the observations. Boyd also challenges Einstein's Relativity. He says it fails the test of Popper's Criteria for Reliability in the Sciences. His conclusion: We need to return to reality, even in physics, and even at the expense of tearing down a holy of holies like Einstein's Relativity. Empirical Science: Back to Reality! "What caused it?" is the primary and most fundamental question in science. What causes that observable event to happen? In fact, this question is primary to existence and to life experience. We are always asking questions in our lives, such as: Where did that come from? Why did that happen? What started it? Who started it? Why did they do that? What was the origination of that (event)? These are all varieties of the same question: What caused it, actually? Because we know that until we find out what is the cause of some experience, the origination of it, we may be experiencing the same painful experience over and over again, until we learn to avoid the results of that cause, or cease performing that particular action. Or we may be missing the same pleasant experience, time after time, until we learn how to get it to happen again. Cause and effect. This principle is used and applied by all Life and all forms of Consciousness, continuously. Knowing the cause of a thing or event is fundamental to existence. Nothing can live without applying this principle of cause and effect, at every opportunity. So learning about cause and effect is a natural condition, and is crucial to all Life. So, doing "science" (in terms of cause and effect) is a natural behavior. The proverbial tale of Newton and the apple that bonked him on the head (it never happened, really) leading to Newton's discovery of the Law of Gravitational Attraction, is an example of how exploring and examining our experiences in order to find what is the origin of the given observable event, results in reliable understandings about how Reality actually works. Robert Neil Boyd sent the following message recently. "Dr. Klein and I have co-written an Appendix to the recent article by me that you have so kindly posted on your website. I was wondering if you would be so kind as to add this Appendix, which is directed primarily towards Consciousness Studies, to the article by me which you have already published on your blog. I'm sure many people would appreciate it, very much." Dr. Adrian Klein, MDD, Israel. In his pilot paper, Dr. Boyd questions the very value of the complex argumentation scaffold currently serving dogmatic authorities in the Sciences, which axiomatically defend misleading conjectures and their totally counterintuitive consequences. Dr. Boyd casts an annihilating spot of light on the shaky physical fundaments identified as sets of underlying fictitious constructs which are ceaselessly multiplying in all the fields accessible (and "acceptable" !) for scientific investigation today. We strongly believe that Consciousness Studies, as one of the most recent fields opened to scientific exploration, would enormously benefit if its current misleading methodology, based on the rotten premises of the aforementioned scaffold of fantasies, would be brought into alignment with empirically supported observations hitherto ignored, denied or intenionally misinterpreted, based on a rigid and biased exclusion of the empirical hard facts. What really and most urgently is required instead, is the exclusion of the various inadequate principles themselves, as held "valid" by current "scientific" methodology, which corrupt principles are continously contradicted by observations. Endless currently running debates in "canonized" Consciousness Studies cluster around the sacro-sanctum emergentist hypothesis, an obsolete remnant of old mechanicistic views and flawed methodological assumptions for scientific investigation. Quantitative measurements and repeatability of experiments are extrapolated as basic requirements in Informational domains, even though these concerns are presently technically difficult or impossible to apply, lacking the proper measurement instrumentations and reliable recording apparatus. The currently accepted universal statement, which causally links consciousness to Brain activity, has been repeatedly invalidated by experimental and experiential deductive falsification. The existing conclusion forbids conscious behavior, not only to manifest in inanimate structures, but also in any concrete instance where any highly organized functional neural systems are absent - such as in lower zoological and vegetal biosystems. This is a blatant and scientifically unacceptible anthropomorphism, which is expecting all of Reality and all of Life to have exactly the same constructions, behaviors, and purposes as the present various misbegotten and vastly incomplete concepts of human behaviors and constructions, which are currently considered "universal". Any dolphin will find these kinds of short-sighted and self-centered human-oriented expectations, silly, to say the least. The protagonists of neural emergence theories of subjective experience are emphatically reminded that no clear demarcation criteria for various types of conscious systems have ever been scientifically established. Thus, no valid statements can be formulated in these regards, from a strictly scientific perspective, as of yet. The mainstream theories of Consciousness rely upon a totally flawed set of observations, implemented upon an extremely narrow range of pre-established assumptions, in particular the singular and narrow window of exclusively Brain-related conscious phenomena. This simplistic and exclusionary methodology miserably fails, due to a wrong and totally unsupported causality, which is dogmatically attributed exclusively to neural correlates of conscious processes. Because of this prejudice, all out-of-sequence anomalies which are recorded, between neural activity detection and volitional functions, are misinterpreted, or simply denied, for the sake of preserving canonical interpretations that are deprived from any empirical or factual basis. While reversing dogmatic causality principles, the SQ approach to Brain-related studies is abhorred and automatically rejected by the scientific establishment, blind to recent publications supporting a hyper-dimensional essence of Brain. These cutting-edge studies extend the Rubner-Kleiber scaling computation laws, thus reaching the inescapable conclusion that a 5-dimensional function is present in neural network connectivity of Brain, resulting vastly wider Information-coding abilities with respect to the Brain, far beyond mere quantum efficiency. The SQ model is consequently ignored or straightforwardly banned in scholastic consciousness studies, because it describes the mainstream Orch-OR phenomenal interpretation in terms of deterministic sequences running under Information field orchestration at all of its manifestation levels, presenting Brain as a highly complex hyper dimensional entropy-stabilizing system using non-physical signalization pathways for integrating self-conscious structures into their energetically-controlled environment. By accepting an infinite velocity SQ signalization system, the new SQ approach strongly corroborates Kurakin's retrosignalisation mechanisms in "hidden-time", originating in Information matrices of a sequential implication order, having instrumentable correlates in the Brain's Quantum regime. The Quantum activity of Brain is causally replaced by Quantum choice instances, evolving in zero (null) time through signal superpositions in vacuum trajectories. Target-related signal transmission blueprints operate at the Mind/Brain interface, thereby removing proactive efficiencies from Brain's low-order energetic combinatorial modalities, into the higher-order implication regime of Information-driven SQ structures and configuration dynamics. The SQ model claims to be a universal statement, but not by any inferences from endless (but useless!) corroborating imaginary(!) statements. The SQ understanding is not the result of such imaginary, fact-defficient, and flawed, inductive reasoning processes. Nor can the SQ be deductively invalidated because this view has an unprecedented explanatory power regarding the All, extending the useful and measurable ranges of corroborative empirical observables, vastly beyond those currently encompassed by popular, yet exceedingly limited paradigms, in all the sciences. The vast superiority of the SQ perspective vs. crippling emergentism, relies in its valid applicability not only in the hitherto excluded(!) empirical domains of observation, but in reductionist interpretations of core Issues, as well, having immediate practical significances in clinical range, such as directly explaining the exact processes which are producing narcotic effects. Our model replaces the theoretical assumption of "causal suppression of Consciousness" in narcotic states of the Brain, by a disrupted afferentation: Signals from the ambient are originating into subjective awareness fields. Suppressing the Quantum resonance ability of Brain, conscious phenomena continue running unaffected in their own organized holographic system, as associated with projective information space. Recent experimental results and empirical observations irrefutably prove the validity of previously most risky prediction of the Subquantum sentience model, in that mnemonic traces of such narcotic-induced dissociative sequences may be recalled by subsequent Quantum superposition effects, triggered by supplying relevant informational triggers, as Subquantum attractors. As overwhelmingly proved by Dr. R.N.Boyd in his aforementioned recent paper, currently prevailing physical fundaments of scientific assumptions totally fail as soon as Popper's criteria for scientific consistency are analytically applied to them. In our opinion, it would be reasonable to show here, to what extent, using the same analytic tools offered by the Philosophy of Science, our Subquantum approach appears to be a vastly superior analytic system, in all respects, when applied to Consciousness Studies. Let's argue at the very start of our considerations, that the kind of confirmations invoked for the current world-view in consciousness studies are totally incapable of duplicating the performance of the SubQuantum paradigm, and are incapable of making any similarly validated predictions. This category of understandings seems fundamentally excluded from the experimental arsenal of "consciousness science", as "Heresy" and "impossible", because these correct and empirical observations completely contradict, and absolutely falsify, all (!) of the present hysterically-held dogmatic imaginings and conjectures. Absolutely no chance is being allowed for any falsifications of the standard emergentist theory. This is being accomplished by the principle of the exclusion of relevant experimental and experiential data, which is kept under lock and key, where possible, as information forbidden for serious scientific enquiry. The ruling epiphenomenalist theory of consciousness dogmatically ignores any results or observations which are incompatible with its imagined "principles". Meaning-filled interactions with asomal or non-physical conscious structures are basically forbidden by the reductionist Brain-centered approach. Unfortunately, due to artificially vaunted "opinion leaders" in the sciences, such limiting prejudices repeat all over the world, defying dogmatic presumptions, and deifying false claims of "irrefutability", all based on biased selections of the relevant testing domains and by dogmatic limitations of what can, and cannnot, be examined. A tremendous experimental database piled up during the last several decades, attests to the highest degree of falsifiability which is allowed by the non-neural approach, which is yielding "almost impossible" correct predictions. Such results are irrefutable proof of the correctness of the SubQuantum paradigm. All the current attempts done by the academic establishment for defending the obsolete epiphenomenalism, are merely ad-hoc auxiliary assumptions, introduced for escaping refutation. To quote Popper's terms, we witness a widely used "conventionalist stratagem", that has to be at last dismantled and replaced by an unbiased analytic approach to the fundaments of sentient reality. The risk of a major paradigmatic shift has to be willingly assumed for the sake of TRUTH, even (and especially!) if it contradicts all the prevailing theoretical frames, which are meant to be transcended. Let us remind our conventionalist collegues, that Popper's basic request for a theory as having an improved effectiveness regarding human knowledge, is defined as its ability to explain "unexplainable" anomalies which exist with respect to earlier theories, implying a certain leap of nonconformist creative imagination. It's hard to conceive of any theoretical approach that might better satisfy Popper's Criteria, than the SubQuantum model. 1. A formal testing of its internal consistency leads to a reliable exclusion of possible contradictions. 2. The model clearly differentiates between its analytic and synthetic elements, being suggested as the result of validated efforts to arrive at the most reliable and accurate axioms. The generalizable conclusions of the SQ model, rely on both experimental and experiential empiricism. 3. The SQ sentience approach has an incomparably wider range of empirical content then the selectively limited one of the conventional mainstream observational range, and thus a vastly superior predictive power, addressing a high falsifiability, in experimental range. 4. These predictions are startlingly novel, bearing the highest improbability coefficient when addressed in the framework of the present obsolete neural-driven scleromorphic paradigm. It's widely known that Popper rejects empirical verification as a valid scientific methodology, replacing it by the empirical falsification request. This IS exactly what the SQ theory of sentience has efficiently performed against the old materialistic, reductionist worldview, conclusively refuted by recent leading-edge scientific exploration teams in the field of wave genetics, asomal intelligent interactions and anomalous cognition phenomena. Under the increasing pressures of empirical data in different fields of scientific investigation, the current reductionist worldview has become demonstrably false. Now, as the prevailing epiphenomenalism stands in critical opposition to the novel insights supplied by the SQ approach, the essential critical spirit in science has to eliminate and replace the prevailing incorrect understandings by the novel and empirically-supported views of the SQ, while unreticently acknowledging its vastly superior explanatory force and predictive power. The causally asymmetrical mind/brain binary system, as conceived in the holistic Bohmian framework by the SQ model, satisfies the critically important prediction requirements of Popper, building its tenets both upon causal (Information-driven) and non-causal (synchronistic Quantum results) mechanisms at work in the background of observable neural correlates of consciousness. where Vs(a) stands for the verisimilitude of the theory "a", Ct[T](a) for the measure of its truth-content and Ct[F](a) for the amount of its falsity-content. The validity of experimentally proved deviations from conventionally expected measurement values have been constantly "refuted" as based on "statistical insignificance" criteria. We see in this approach a fatal methodological flaw and the origination of an endless piling-up of false conclusions, which wrong conclusions are constantly re-organized into a "self-defending" system, by the conventional physicality view. As pointed out by J.S.Armstrong, statistical significance tests are of no value as compared to confidence intervals, which increase progressively both with the signal/noise ratio, specific to the test performed, and as the square root of its sample size. When applied to new theories addressing anomalous effects in experimental Informatics, there is an inescapable increase of the confidence range attained, both by the increasing refinement of instrumentation used in research programs, and the cumulative reinforcing effect of the exponentially expanding sample sizes addressed. In Consciousness Studies, one should never forget S. Zilik's conjecture, that "The test itself is neither necessary nor sufficient for proving a scientific result". This conjecture further increases the legitimacy of investigation efforts in methods which take advantage of improved and available instrumentations, which in turn implies freedom of scientific thinking, presently miserably suppressed by scholastic dogmatisms. Researchers in the field of fundamental consciousness/sentience seem to intentionally overlook the fact that the "experimental replication" requirement applies only selectively in science, as stressed by J. Shaffer. For example, this requirement has a very limited applicability in social sciences, and an almost null value in consciousness studies. Moreover, under the current canonical suppressions of any changes which are apparently jeopardizing accepted fundaments, Bayesian statistics become almost entirely excluded from the tool box of investigations, as the required "prior probability" for anomalous Informatic effects is preset on zero. All this said, the statistical approach to experimental results in our field of interest is still of a certain value, provided its rules are correctly adapted to the circumstances of the particular field. A well-balanced approach, based both on transposed conditionals, and the Ocam's razor principle, is required for valid interpretation schemes of experimental outputs, especially in those consciousness studies which are performed under "no brain activity" conditions. We should bear in mind, that meta-analytical strategies might prove extremely helpful, also. Subquantum Informatics, as applied to Brain-related consciousness studies, implies a drastic revision of effect magnitudes, as seen from a combinatorial meta-analysis perspective. The behavior of statistical properties, as derived from analytical inclusion of extended meta-analytical datasets, may surprisingly contradict previous research results, as soon as the high-variances allowed by retro-causation, operating in null time, and originating in pre-organized sets of hidden variables, are allowed as valid statistical units, and introduced into the Pearson correlation. Pearson correlations are established between essentially subjective Qualia and their correlates of objective neural Quantum processes. By adapting Consciousness studies so as to allow hitherto "forbidden" experiential results, such as meaningful cognitive interactions with non-Quantum-supported conscious structures, first requires extending the "signed differential mapping" approach beyond neural-functional considerations. In this situation, under an all-comprising meta-analytical umbrella, biased and prejudicial discrimination tendencies are not allowed. The SQ Information model emphasizes such unbiased investigations as fundamental criterion in determining the attractiveness of selecting among various valid estimators, as appropriate to the highly complex phenomena involved in subjective sentience. Carefully designed experimental protocols, partly based on objective randomization methods, must replace past prejudice-charged limiting behaviors, thus allowing for novel insights into the fundamental nature of Sentience, as an overarching, originating, and organizing principle of physical Reality, rather then its byproduct. The SQ model for sentience has no detectable internal logical inconsistency. It supplies an unprecedented explanatory framework for hitherto dogmatically excluded observation results, provided properly field-adapted statistic analysis tools are used (as discussed above). A crushing empirical evidence is available, as corroborating the SQ model of sentience, including logical correlations at the background of anomalous physical effects wrongly labeled as "paranormal" occurrences. Their significance is overwhelmingly proven by Sackett's formula for analytical and interpretational confidence. The SQ interpretation is a fundamentally non-axiomatic one per-definition (apart from its hyperdimensional frame of reference). Causally disconnecting conscious effects from Brain quantum activity, the wide arsenal of artificial and dogmatic statements, as required by the emergentist approach is thus removed. The proposed revision of current paradigm covers an endlessly large plethora of predictable and empirically verifiable predictions, when compared to the present biased and intentionally narrowed application fields of the presently prevailing concepts of Consciousness. The SQ Information approach leads to dramatic changes in the very fundaments of current understandings and interpretations of Reality, its basic statements are vastly more accurate to an infinite range of observable facts in nature. The predictions of the SQ paradigm sharply contradict the presently held "acceptable concepts" in the framework of neurogenetic consciousness, yielding strong experimental evidence hitherto ignored, or simply denied by conventional interpretation trends. At the same time, the SQ perspective in no way contradicts any of the well established and empirically verified laws of physics. Rather, the SubQuantum perspective extends present understandings into a more permissive and comprehensive reference frame. As a result of the extreme "risk factor" it takes in designing its experimental support, the SQ view of sentience has a maximal falsifiability index, when examined under normalized statistical analysis. In summation, the Sub Quantum paradigm, in all respects, regarding all topics of its applicabilty, exactly, and without excuse or argument, meets or exceeds all of Popper's Criteria. Indeed, there are no other factions or partitions, in all of the sciences, which can make such a claim, and demonstrably live up to such a claim, even in part. It is high time to drop the "neuro-emergentist view" of Consciousness into the waste bin of the history of science, where besides the Einsteinian Relativism (and all its fantasy consequences) it will have to meet many other by-products of the current counterintuitive "standard interpretations" of Quantum theory. A new, and far more comprehensive, empirically-supported world-view of Information-driven SubQuantum correlations, is to be acknowledged as a vastly superior approach, when compared to the present exceedingly limited neurofunctional "Quantum interpretations" of sentience. Sentience is not originating in Space-Time bound Quantum processes. Sentience is the basis, the orgination, the orchestration, and the organization, of all the rest of everything else. The conscious Self does not need a Brain in order to express itself, though it is able to use it in transient bidirectional coupling periods as according to Quantum-ruled phenomena. The interface between Self and the brain, and the hyper-dimensional essence of Self, must be openly addressed. This is of course assuming the implied risk of demolishing any and all prevailing dogmatic premises, for the sake of TRUTH. Any and all behaviors of paralyzing suppressions of any nonconformal statements of natural philosophy, must be in their turn, suppressed, and a new climate of fresh thinking freedom must be allowed to penetrate into the academic establishment. Back to Reality, back to Popperian criteria for its investigation, back to common-sense and observation. Back to Empirical Science instead of postulating false "working hypothesis" that lead to absurd, imagination-based Fairyland interpretations of the fundamentally Timeless Reality as a whole. The hydrogen pop up in a high vacuum is new to me. If proved, we can´t deny that conservation of energy has to be taken to a different level, make it valid within a single reference frame only and allow mater creation and surplus energy in physical transformations and methods between reference frames. It is difficult to perceive infinity, and that we can break matter infinitely. The probability of unknown agent’s existence is almost certainly 1, as well “simple hidden variable theories” a reality within our perception. Around us, we see evolution and grow up from fragile to perfection. Conservation of energy seems to be a universal preference (for symmetry) rather than a law that can't be broken under any circumstances.